50. Worship God-Des and She Tonight at Crush! Wow, we sure have been highlighting Crush a lot here at the 365PDxq blog. Probably because they have been crushing it with some great events. Tonight, you can check out the lesbian hip-hop/soul combo (and L Word favorites) God-Des and She at Crush for only $5 (wha?!?!? Such a deal!). So, the duo started making music together in the Madison, Wisconsin, and then had their big break when cast in the Season 3 finale of The L Word. They have riden that acclaim and success to a nice touring life. They were also featured in the terrific queer hip-hop documentary Pick Up the Mic. 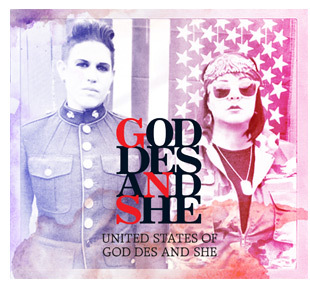 And, now it is time for a brand new album….The United States of God-Des and She. This entry was posted in event, lesbian, music. Bookmark the permalink.